Well, guys, I still can’t believe it is actually over. 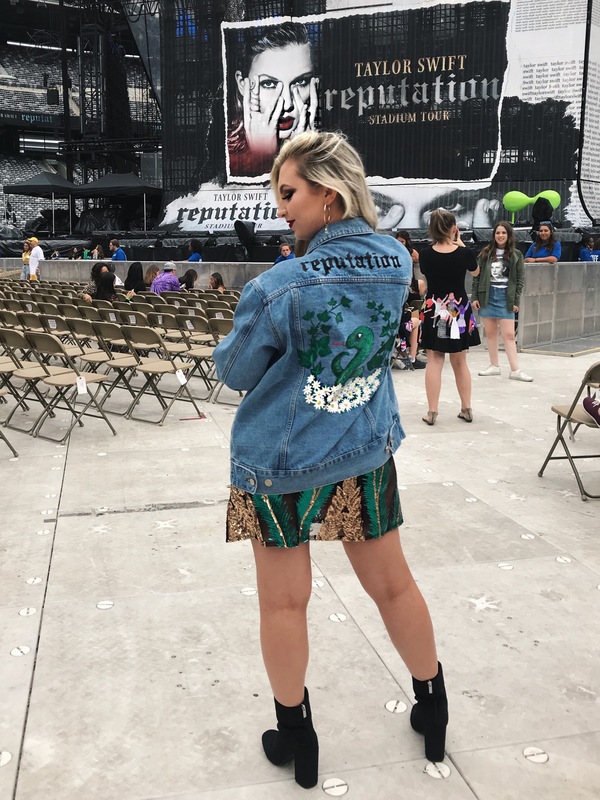 I had been counting down the days since December 2017 and my reputation Stadium Tour show finally happened. And it was everything I could have ever hoped for and more. As I was preparing for the concert, I noticed the lousy weather for the weekend and started to worry. I had purchased amazing seats for this concert and did not want the rain to ruin my perfect day. I had planned on wearing my original outfit but taking a poncho with me if it did rain. My boyfriend, my friend Heidi, and I drove to our hotel bright and early on Saturday morning. We knew check-in was not until 4 pm but we had hoped if we got there early enough, maybe we could get in a bit beforehand. 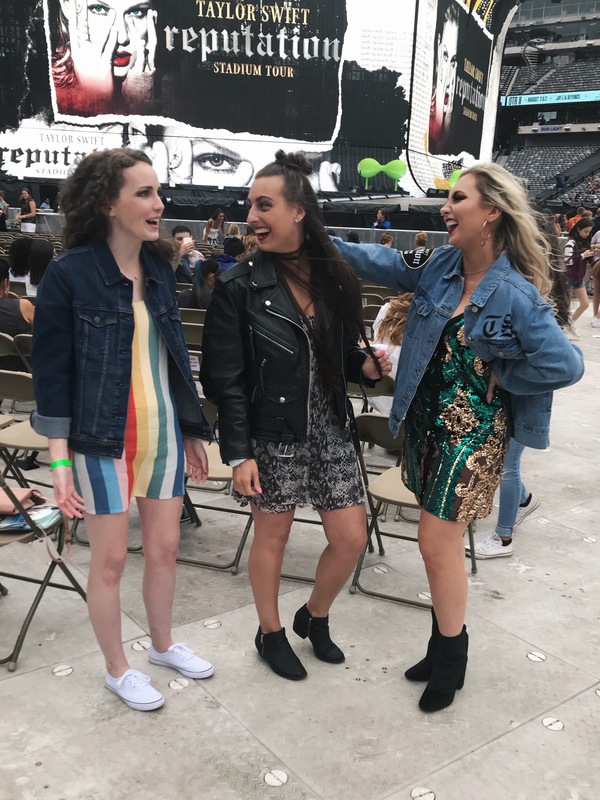 Fortunately, they let us in right when we arrived and we were able to spend plenty of time getting ready and mentally preparing ourselves for the best Taylor Swift concert yet. Our friend Colleen met us there and we finished getting ready and took a shuttle over to MetLife Stadium. I was hoping the rain would hold off just long enough for us to take a few photos and then I really didn’t care. 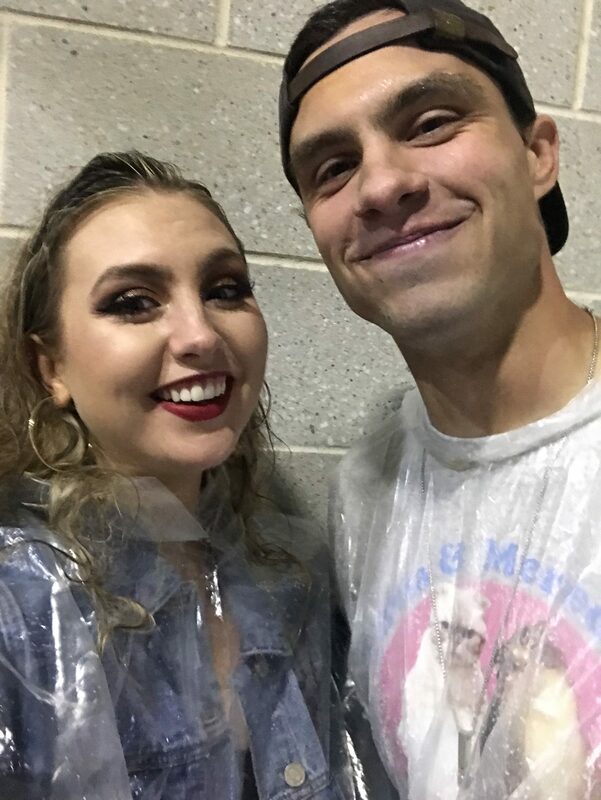 Thankfully, we got to our amazing floor seats, took millions of photos in front of the stage, and the rain held out… until the concert started, that is. Charli XCX opened up the show with a killer setlist to get the crowd going. She had an infinite amount of energy and was the perfect start to the show. Next was Camila Cabello, who I was super excited to see. Her album is AMAZING and I highly recommend it to those who haven’t listened. She is so incredibly talented and I know that in a very short time, she will be selling out stadiums just like Taylor. 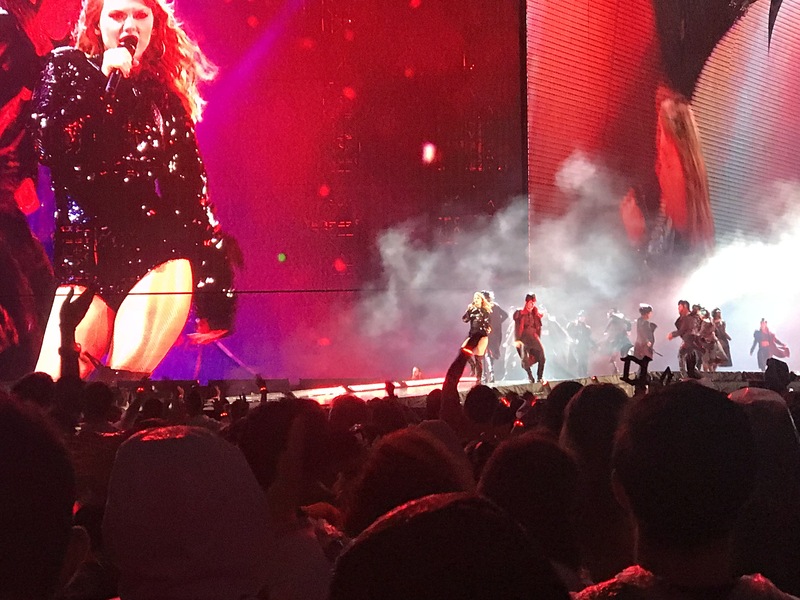 As the opening performers went on, the light sprinkling increased to rain, and when it was Taylor’s turn, it started pouring. But I honestly did not care. I think there is something so magical about listening to Taylor Swift in the rain. I honestly believe I wouldn’t have had a better time if the weather was beautiful. 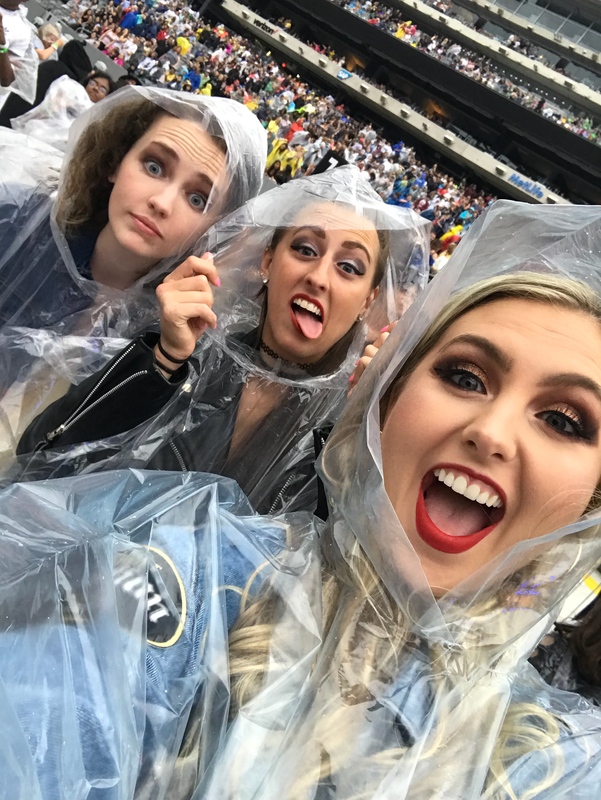 The entire crowd was in ponchos and rain jackets and they were still just as excited and happy to watch Taylor perform. And Taylor put on one hell of a show and got soaked right along with us. The rain did not make her miss a single beat. She sang every song beautifully, her dancers were fierce, and she performed every song from the setlist. 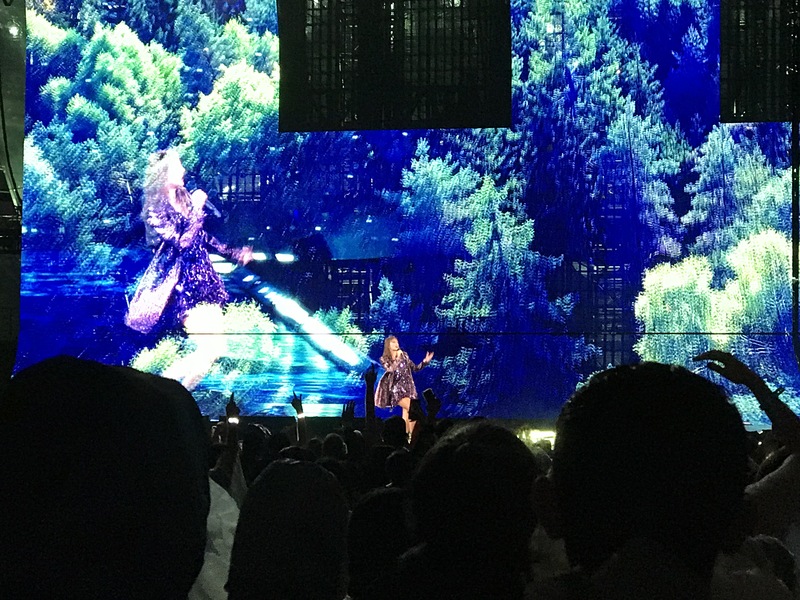 Her surprise song was Fearless which made me tear up. What a beautiful ode to her past, listening to her literally sing in a storm in my best dress. Listening to Clean in the rain was a religious experience, I swear. 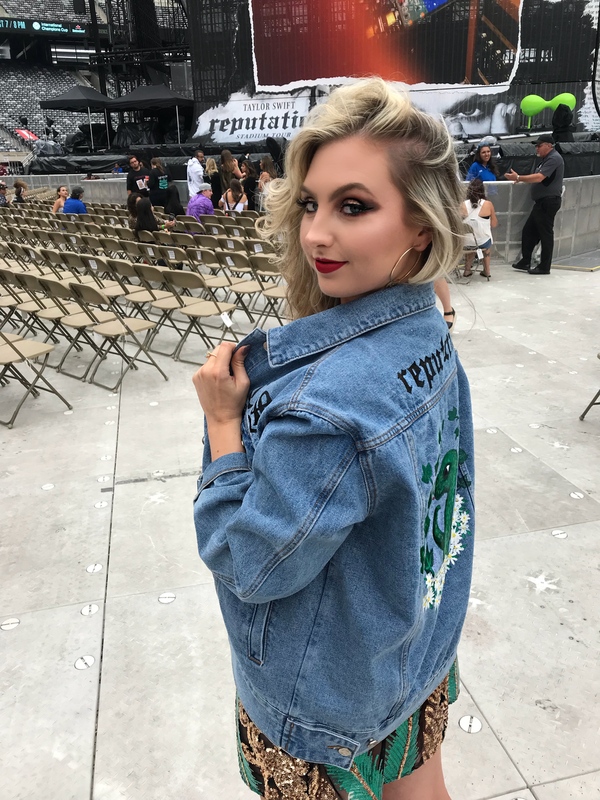 From the reputation album, I was most excited for Don’t Blame Me and Getaway Car and those did not disappoint. She hit that note in Don’t Blame Me like it wasn’t pouring down rain and she had just performed an entire show, even though she did. 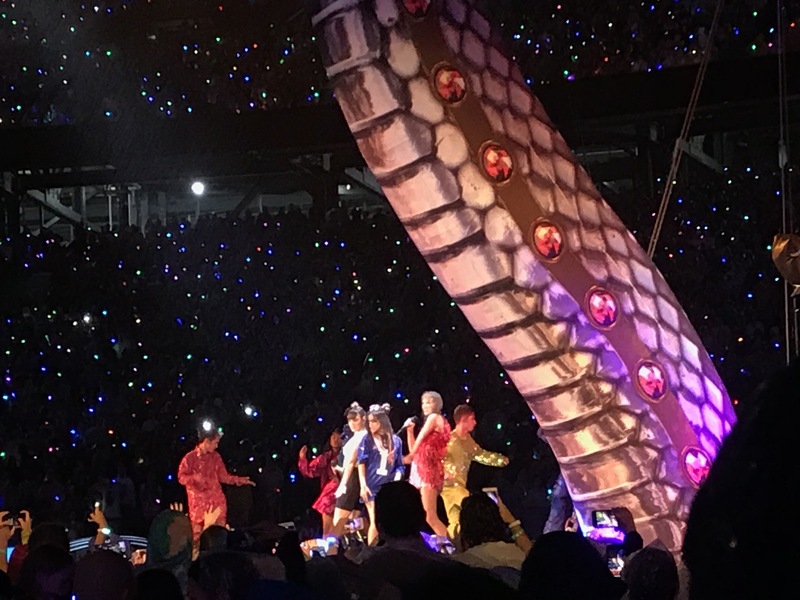 Since I did not know the setlist beforehand, I assumed she would close with Look What You Made Me Do, which – don’t get me wrong – would have been a great finale, but she instead closed with This Is Why We Can’t Have Nice Things and I did not realize it until the show that it was the perfect choice. At the end of the show, as Taylor Swift was saying goodbye, I could feel myself starting to cry with pure happiness/excitement/sadness that the show was over. It was a huge array of emotions and it only reminded me of the time I met her last November. Don’t judge. 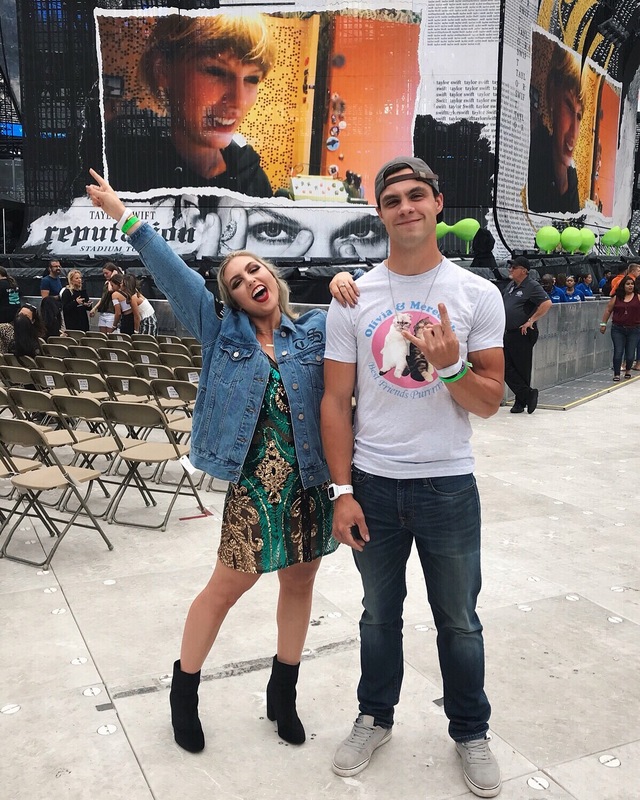 If you have the chance to go to the reputation Stadium Tour, I say run, go, have a BLAST. It was the best concert I have ever been to, hands down and I would sell a kidney to go again. And now I don’t know what to do with my life until TS7. P.S. A blog post entirely dedicated to my outfit is coming up soon! Did I also mention my makeup didn’t budge AN INCH after it poured?!? Stay tuned for my next post to see what I wore!